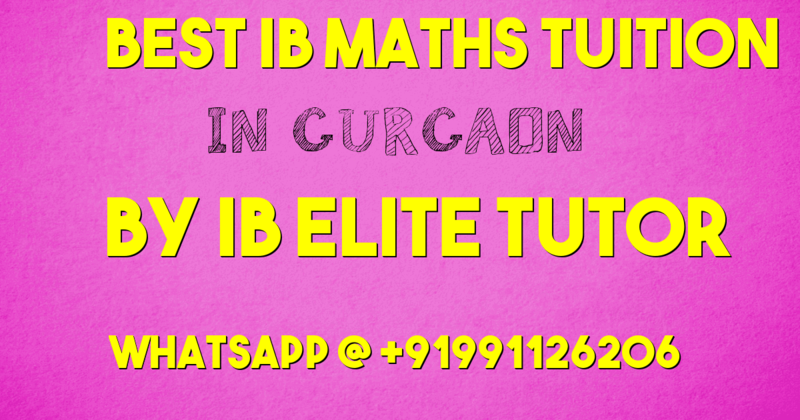 IB Maths Tuition in Gurgaon is the best and simplest way to get improvement in grades. We believe that all children are unique so are their problems. In the school environment, teachers are really qualified, trained and experienced. They are capable enough to deal with the curriculum related problems but they have their own limitations too. They always have to deal with a big group of students. In that group, some students are very quick but some are slow learners. School teachers are not able to provide their students the required personal attention. Thus some students are left behind and after a short period of time, they begin to struggle with the subject. Seeing this some parents hire group tuition classes for their sons/daughters. But here the scenario is no more different. IB Maths Tuition in Gurgaon or IB Tutors in Delhi provides the required personal attention and assurance of improvement to each and every enrolled student. At school, there’s a time limit and a teacher in a class is able to give only limited attention to every student. Because of which, your child might find it difficult to learn the topic or topics very clearly. However, in one-to-one private IB tutoring, your child will get more personalized attention from the IB Tutors and he/she will be able to comprehend the concept more clearly and focus more on the specific subject areas or topics. The main advantage of IB home tuition in Gurgaon is the advantage for your child to learn in the comfort of your own house or some other preferable site. It also gives you the flexibility to choose your own preferred days and time of tutoring according to your availability. Learning in your place contributes to better utilization of research time and aid in effective learning. If your child is weak in any particular subject or topic, with IB Tutors in Delhi and Gurgaon, he/she can give additional time and concentrate more on that subject or topic. A home tutor will help improve your child’s concentration and improve his/her overall academic performance. One-to-one home teaching with a qualified home tutor may also help assess areas that need extra efforts and deliver up your child to speed. With one-on-one care and home tutoring, Parents and home tuition teachers are better able to assess a child’s growth, performance, and place where he or she lags behind. Home tutor better understands a child’s learning capability so they can easily analyze and supply regular feedback on the student’s answers as they work. This assessment will promote and support your children in developing self-learning skills, thus assisting them to finish tasks or assignments at the pre-defined time. IB Elite Tutor provides private home tutors or online IB tutors who can offer a pupil with needed support and care when preparing for tests and examinations. Private tuition in home empowers students to work smarter and achieve more in their exams. With a personal home tutor, pupils are able to focus more on a specific issue area. And they can work hard to improve them by asking questions, either large or small without feeling ashamed. A private home tutor works with students through previous exam papers and supplies useful methods to achieve the desired goals and objectives.